A smart and fascinating movie that is part comedy and part psychological drama, this one keeps surprising us and getting better as it goes on. 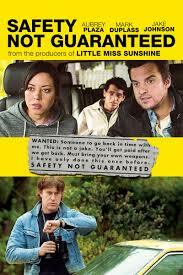 Safety Not Guaranteed is not what you would expect. The first half might be all setup and getting us involved in a creative premise, but boy does it go places after that. The idea here is that a team of three reporters is out to find a guy who thinks he can time travel. Once they find him, they don’t just interview him, but instead send out one of their members, (Darius, played by Aubrey plaza) to basically go undercover and convince this man that she wants to go back in time along with him, the second half of the movie takes this entire premise and spins it on its head, explaining to us what it all means and how things got to be this way. It is a very smart film that keeps unraveling as it goes on. Safety Not Guaranteed is a very unique and creative movie. A week later and I am still in shock about the ending, but it would mean nothing if the whole movie, leading up to it, was not great. As it happens, this movie is. It’s a black comedy of sorts built on a really out there premise about a team of news reporters. Really, it is just one reporter and his two interns, who set out on a mission to deal with a person who might very well be insane. The reporter is Jeff (Jake Johnson, of TV’s The New Girl.) He is the guy who is actually getting paid by the newspaper and has some merit and credentials to his name. Jake might be the one leading the way here, but he is not the star of the film. That honor goes to Darius, (played by Aubrey Plaza of TV’s Parks And Recreation.) the movie starts out with a voice over and montage showing Darius growing up, ever since she was a little kid. It’s a cute montage with lots of humor about how she never fit in, but the best part comes at the end when we see that the whole story she is telling is for a job interview, and she is coming off as a bit of a loon, by literally giving this guy her life story. That is funny considering that the main story is about them going to find a guy who might really be a lunatic. They see an ad in the newspaper where a guy is asking for someone to go back in time with him. Jeff has the idea that they can go find this guy and talk to him, and since the paper is lacking in stories and out of ideas, his boss green lights the proposal and sends him and the two interns on their way. Aubrey plaza is a pretty good leading lady, and here is dead on the money as a character that is actually pretty serious, and also pretty depressed. The world has not been very good to her. I just saw her in another movie, the to do list, and while that movie wasn’t all that great, she definitely handled her starring role well, and showed that she has what it takes to be a leading lady. Here, in safety not guaranteed, she is even better. We understand her plight and how she feels out of place in the world. Especially when her father (Jeff Garlin), tells her that he has been speaking to her college roommate and checking up on her, and knows all about her lack of a love life. Darius, Jeff, and the third member of their crew, an Indian college student, named Arnau, head out on their journey. when they arrive, they settle up in the hotel room, plan out who is taking which bed, and then head out to find this guy. All they have to go on is the post office where he has got a mailbox and so they pull a stakeout, sitting in a car, staring at that mailbox until this man comes to get his mail and check on it. The man is Kenneth (played by Mark Duplass), and Jeff is the first one to approach him about the add. Kenneth quickly rejects Jeff, sensing that something is not quite right. That is when Darius comes by and gives it a shot. Kenneth is much more receptive to her. Maybe that is because she is a woman, but it is also probably because Darius seems somewhat legitimate. She does not exactly buy what Kenneth is selling, but she’s will to open up to him about her dead mother and seems like a pretty vulnerable person. The movie now takes on the point of view of each of our three main characters from the news crew. With Darius, it is her spending time with Kenneth, and the two of them getting to know each other. He tells her stories of his dead girlfriend and explains why he wants to go back in time to be with her. With Jeff, a story unfolds about how he really came to town to check on one of his old girlfriends who he has been thinking about. Jeff checks in on her and then starts up a relationship again. Even Arnau gets a small story about how he has never really been with a woman and needs some advice from Jeff on how to be cool. This story happens after Jeff has met some disappointment with his romantic situation and cannot sit around watching ihram not going for it any longer. He fixes Arnau’s appearance and helps the guy get on his way, inviting some attractive girls to join them for a night of fun. But the real story is the one that involves Darius and Kenneth and that’s where the movie truly succeeds. It’s inevitable that there will be some kind of romantic spark between them, although how it actually happens is unpredictable. No sooner to things start to pick up between them, however, then do secrets begin to come out. Kenneth takes Darius on a raid of an engineering building where he steals something that he calls lasers. Soon the FBI are looking into him and stopping the reporters, wanting to know what they are up to. I like all the reveals that come out towards the end of the movie, and then the final moments that really shock us. This movie works on a deep and psychological level about repressing things and being mentally unbalanced. Despite those plot threads; there is also plenty of humor. Both Jake Johnson and Aubrey plaza are comedic actors, and so they bring that sense of humor to the film. It is a very unusual movie and a very good one, and I really like where it goes in the second half.